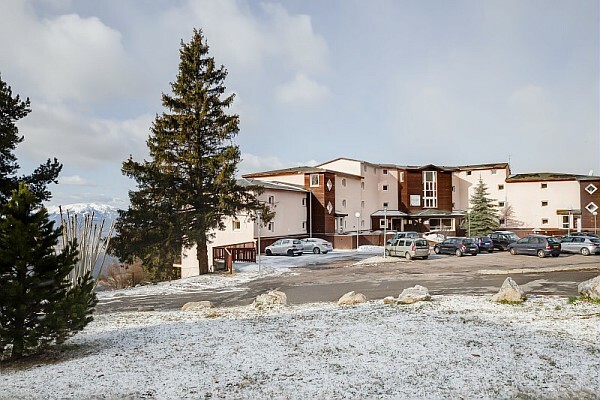 Le Domaine de Castella has a great location, just 300m away from the centre of Font-Romeu and the lively resort centre with its numerous shops and services. 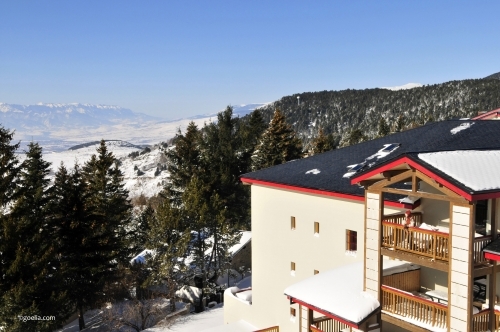 The cable car with its 10 minute ride to the ski slopes of Font Romeu Pyrenees 2000 is just 600m away. 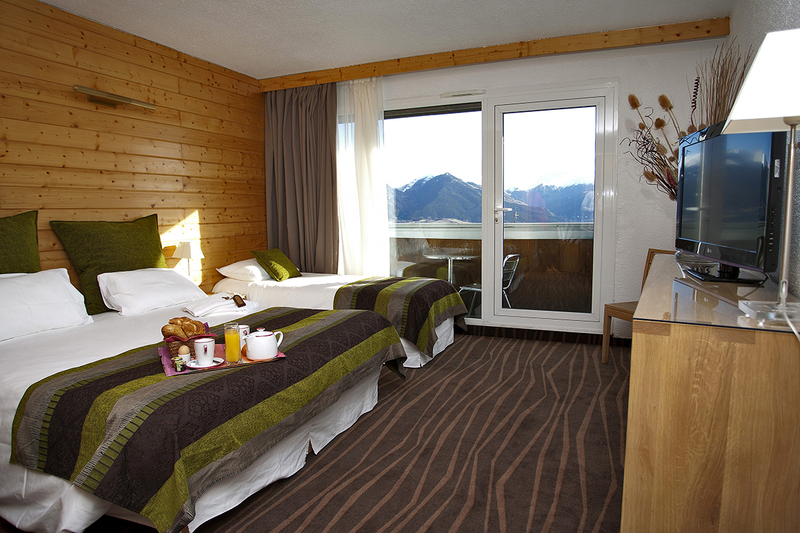 Le Domaine de Castella in Font Romeu is a great choice when it comes to great value accommodation in a good location. 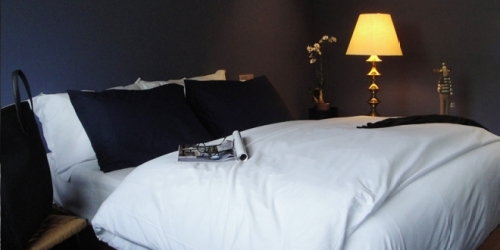 The residence has been recently built and is composed of 107 self-catering apartments, spread over 3 four-story buildings with a lift in most buildings. 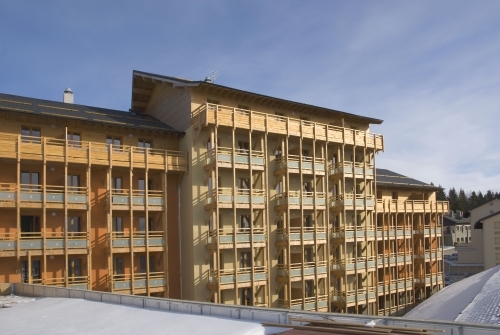 Most of the apartments at Le Domaine de Castella in Font Romeu offer a beautiful terrace overlooking the mountains, however there are some apartments that have no balconies but enjoy a beautiful southern exposure which can be enjoyed through large bay windows. 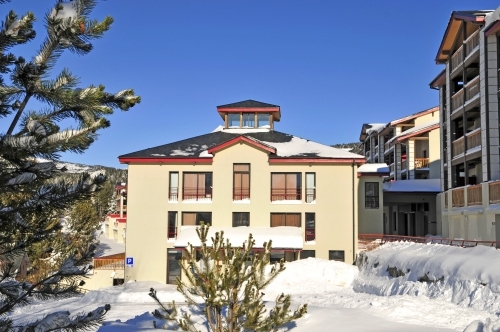 The Gondola is just 600 m away and is easily accessible on foot or by the local ski bus which stops in front of the residence. A 10 minute ascent on the gondola take you to “Plateau des Airelle” – the starting point of the ski area and all the fun. This ski residence has amazing views – on entering the reception area with its large bay window and terrace looks out onto the Catalan Mountain range in all its glory. These spectacular mountains reach heights of 2,900m and span the border between France and Spain. 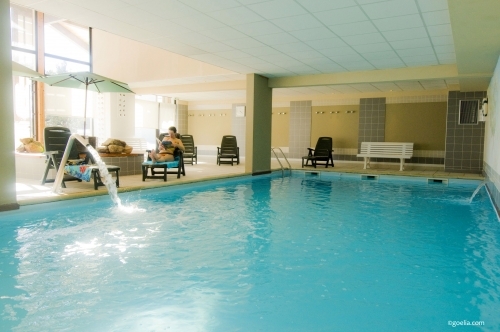 The indoor heated pool and the fitness room (5mx9m) which are free of charge for guests is great for all the family whilst the sauna is great after a long day’s skiing on the nearby slopes (payable). There is also welcoming communal lounge area with a fireplace - ideal for relaxing on those cold winter nights as well as a small breakfast room for those wishing to enjoy a continental breakfast. 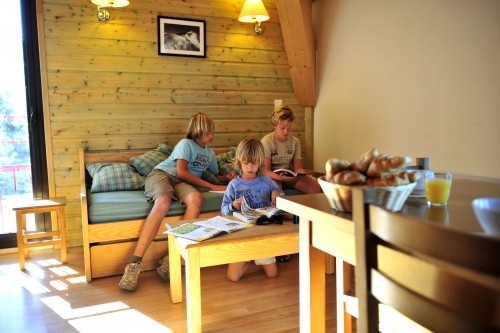 Other facilities at Le Domaine de Castella include board games, supplementary kitchen equipment and baby kits on loan and a laundry room (payable). All the apartments are fully equipped with kitchenette with ceramic hob, extractor fan, microwave/grill, fridge, dishwasher, electric coffee machine, kettle and toaster. The bathroom comes with electric towel rail and separate toilet. Certain larger apartments have an extra bathroom (upon request & subject to availability). Studio sleeping 2 (ca. 20m2): Open plan living/dining area with a sofa bed (converts to 2 single beds), bathroom with WC. 1 Bedroom Apartment sleeping 4/5 (ca. 35m2): Open plan living/dining area with a sofa bed (converts to 2 single beds), 1 double bedroom, extra fold away bed may be available upon request, bathroom & separate WC. 1 Bedroom Alcove Apartment sleeping 4/6 (ca. 30-40m2): Open plan living/dining area with sofa bed (converts to 2 singles beds), 1 double bedroom and 1 alcove with bunk beds, bathroom and shower room & separate WC. 2 Bedroom Apartment sleeping 6/7 (ca. 45m2): Open plan living/dining area with sofa bed (converts to 2 singles beds), 2 bedrooms with double or twin beds, extra fold away bed may be available upon request, bathroom & separate WC. 2 Bedroom Alcove Apartment sleeping 6/8 (ca. 55m2): Open plan living/dining area with sofa bed (converts to 2 singles beds), 2 bedrooms with double or twin beds, 1 alcove with bunk beds, bathroom & separate WC. 3 Bedroom Apartment sleeping 8 (ca. 65m2) Open plan living/dining area with sofa bed (converts to 2 singles beds), 2 bedrooms with double or twin beds, 1 small bedroom with bunk beds, extra fold away bed may be available upon request, bathroom & separate WC. Please note: Alcoves are usually not enclosed, have bunk beds and no window. 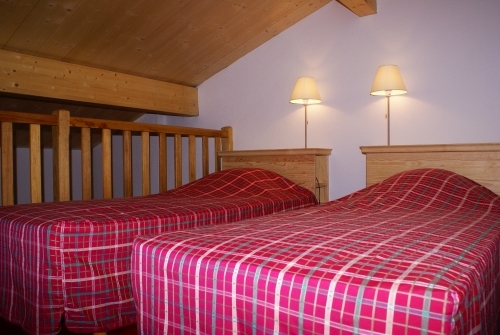 For any apartments at Le Domaine de Castella in Font Romeu that feature bunk beds, sleeping in the top bunk is not recommended for children under the age of 6 years old. 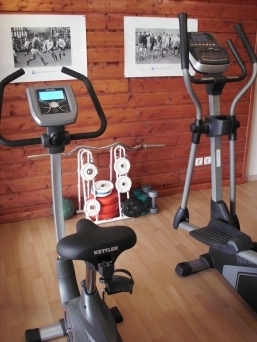 Fully equipped apartment, ski locker, free access to the indoor heated swimming pool (5m x 9m) and gym (open from 10:00 - 19:15), free Wi-Fi internet access in the main reception area (during opening hours) and one free space in the underground parking. Refundable breakage deposit: €250/apartment - Please note no deposit, no keys! Cleaning kit (dishwasher tablets, small multi-purpose detergent, small washing up liquid): €7/kit. 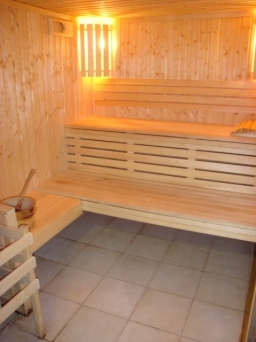 Pets are allowed and will be charged €39/week (payable locally). A valid passport for your pet is compulsory (max 1 pet/ apartment). Board games, Raclette and Fondu sets and pancake griddles (all subject to availability, small deposit required) and free of charge. Arrival day at Le Domaine de Castella is Saturday (and other days on request) 15:00 - 19:00 and departure by 10:00. (Contact residence by 18:30 if arriving late).